basic 65: note the C64 styling. 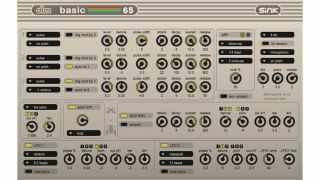 When we rounded-up nine of the best chiptune VST plugins last year, De La Mancha's basic 65 was among them. So, we're pleased to be able to report that it's now available for free. Previously retailing for $24, this 3-oscillator synth is designed to recreate the sound of the Commodore 64 and its classic SID chip. However, it also offers a number of additional features that enable you to take your 8-bit sound further. Specs are below. You can download basic 65 for free from the De La Mancha website, though the developer suggests that, if you like it, you make a donation to Cancer Research UK. It's supplied as a Windows-only VST plugin.